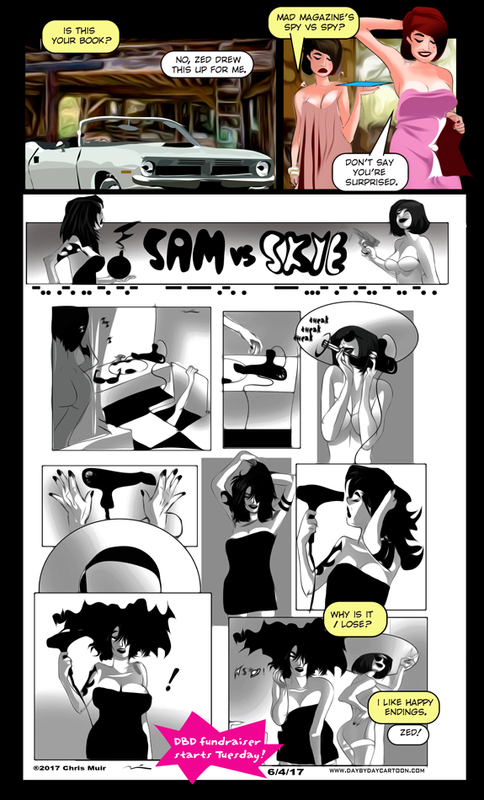 Sam vs Skye, Spy vs Spy? I can dig it! I can just see the eagle-eyed folks here wondering about “sleeves”. I only noticed becuz I am too dumb to figger out (a-fargin-gain) what is goin’ on. Spy vs Spy, one of my favorites from the old Mad Magazine days. That, and Spy vs Spy vs Spy, when the Lady in Gray was occasionally introduced. She was a real “knockout” (hehehehe). OK, the Morse code line starts with “DRINK”, but after that I’m losing it. What gives? 3rd panel? best as I can see it says “tweak tweak tweak” not morse code. The dashes joined together on the M and the Os. Took a second to figure it out. Once I saw “valtine” I remembered A Christmas Story and figured out the joined dashes. Damn advertisements. According to my mother, who grew up during the 1920’s and ’30’s, all the secret messages on the Little Orphan Annie radio show ended up plugging Ovaltine. The archive page shows the whole strip. My page shows the weekday sized strip, missing much of the strip as it is off the shown area. Seems that when comments are showing, the comic is clipped. It’s the same for my view. I also lack any and all background material I’m accustomed to. Clicking on Home brings the full cartoon, and a very interesting pop-up for Revolution 1776 which is Coming Soon. Once that’s faded the full comic is there, but clicking to comment results in loss of all but the top panel. OK, Chris, when I use the calendar to navigate, there’s no comments. If I go back to the home page I can click the comments, or if I use the “previous” button on the home page, I will see those comments (which are still open, btw – that’s unusual). And, I’ll echo the “only see part of the comic” bit. And, belated Happy Birthday, Pamela! Thank you all for the Birthday wishes, I was out in the desert dealing with estate stuff. Nice Phoenix… Nice drop top too. Love the firebird, the heart is a great touch. And like Vince says, very nice drop-top. Nice. We get to see the live Pamela, before ink, and after ink. Your convertible? Glad you all like the tattoo and the car is my husband’s. We did a frame up restoration on it. I have one in pieces in the garage awaiting its turn in being brought back to life. Not ‘murcan iron I think but I can’t ID it…body and cockpit wrap make me think early SL, but dash and controls not…help a brother out? Better yet before you spill the beans, who think it’s what? It would be wrong to suggest that Sam could, instead, have joined Skye in the shower, resulting to two happy endings. So very, very wrong…. DBD is all about squeaky clean fun. (Snerk). I like how Spy Sam sabotaged Spy Skye’s hairdryer. I believe it is meant to read “drink more ovaltine”. But the dash characters in the ‘more ovaltine’ wording is poorly spaced, at least on my monitor. The comments and clipping of the image will be resolved soon, says my website guru.She’s working on the WordPress template.For now, click home to refresh the site and you’ll get the whole image. Of course, my dumb question is how did Sam get that Yuge hat through the trap door? It’s a cartoon. Lots of imagination. The sleeves are back because this is a ‘toon within a ‘toon; Skye is in “reality” still on the straight and narrow and clean (no tats, no envy, and surely no tweakin’…okay maybe still some envy as she learns and grows and emulates). BTW “tokin” would have been the better doper vernacular as while I’m sure the old Skye was into some relatively innocuous weed I’ve never seen signs of the deadly poison meth. There is NO comparison. As to the navigation issues, now that’s where Chris will be engaging in a little tweakin’ of a whole ‘nother sort…all of this required jumping around to get the whole page experience does diminish it some but not terribly. edit…I see now it is Sam doing sneaky tweakin’ to the dryer, not Skye doing the deadly kind. Shoulda knowed better. Skye has all her teeth? Then no meth. If Sam, Skye and Zed wind up in a three-some I might quit reading. Is it my imagination or is Skye carrying a tray… as in doing something useful? Sorry but no, that her kindle reader. Talk about a BAD HAIR DAY for Skye. Sam you are cool and a bit devious. Thank you all for the Birthday Wishes. I was out in the desert dealing with estate stuff.